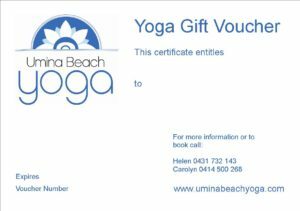 Umina Beach Yoga Shop sells all things yoga…and more. We stock a wide range of products from mats and bolsters to organic cotton t-shirts, Eco leggings, essential oils and diffusers. Purchases can be made in store. Come and have a browse! You can buy vouchers online or in store. Vouchers can be used to buy yoga classes and workshops. Just let us know what you are looking for and we can help. 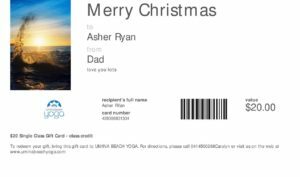 Here is an example of our online voucher and the vouchers you can buy in our yoga shop.